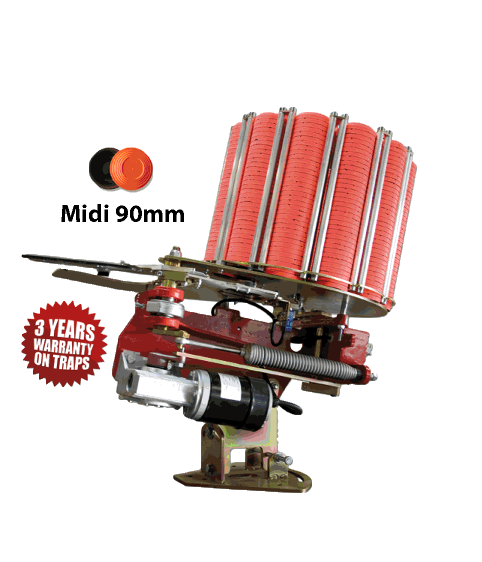 We are pleased to offer a selection of LAPORTE SPORTING TRAP MACHINES. More proficient, more accessible and more attractive than ever, the 185 PC 320 6C enhances your sporting ground to new perspectives and adventures. From the PC PRO range of advanced technology, it is the LAPORTE® response to all of your requirements. Designed for all situations and the most extreme conditions, the 185 PC 320 6C PRO is lighter than the PC range at 104 lbs that allows you to transport it easily. Its tilting base provides a multitude of shots with manual horizontal adjustment (30o to the right and 30o to the left) and manual vertical positions (maximum height of 70o). For a more complete machine, the LAPORTE® team have integrated a setting for down hill shots on a range of 25o with the horizontal (amplitude adjusts 45o with the base Downhill LAPORTE® option). Fitted with a single tool, you can achieve all settings (firing angles, spring setting, magazine assembly) in record time and with ease. The 185 PC 320 6C has a new-age motor combining performance with very low consumption. 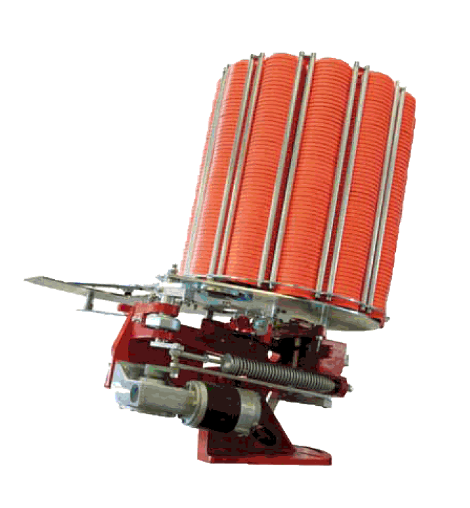 It offers an exceptional autonomy and will not need refilling until well over the 8000 clays mark. The LAPORTE® designers have gone even further to meet your expectations and deliver this unique concentration of lightweight, reliability, performance and precision. Delivered with 50 yards of professional cable. Laporte has applied its latest technology to the PC 400 PRO 8C which, since its creation in 2006, has been the most requested product in the Laporte Sporting range of machines. Approved by the FITASC Federation, the PC 400 PRO 8C combines reliability and ease-of-use with one tool for all settings, massively acclaimed by the clubs and selected for the World and European Championships. A true technologically advanced machine thanks to its new adjustable base, which allows a multitude of firing positions with lateral adjustment (tilts 35° to the right and to the left) and vertical positions (tilts 65° back). All parts have been treated against corrosion. 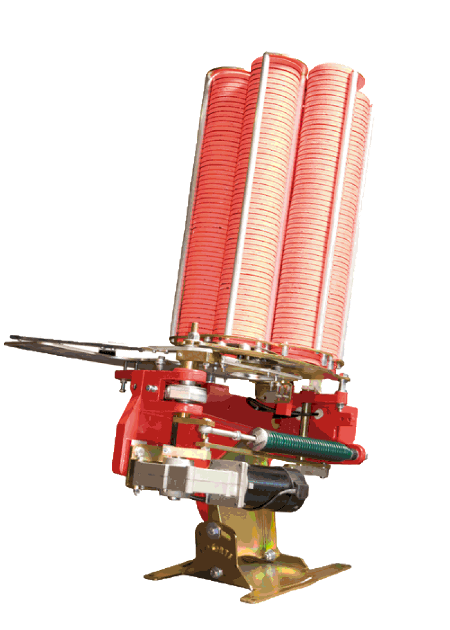 The machine is equipped with an unbreakable throwing arm that benefits from a lifetime warranty and a special clay position finger placed on the throwing plate that ensures an extremely consistent and accurate trajectory no matter what the orientation is. Laporte guarantees quality and guarantees the PC 400 PRO 8C with a 3-year warranty. 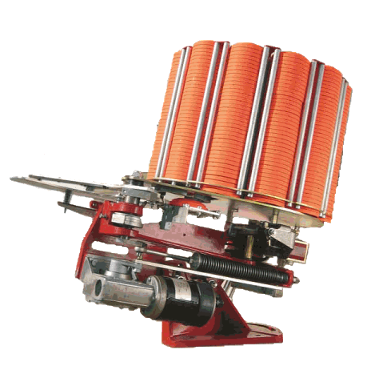 The PC 550/700 PRO 12C is available with 550 or 700 clays - Purposely designed for strength, capacity, accuracy for improved throwing distances makes it a leader in its field. 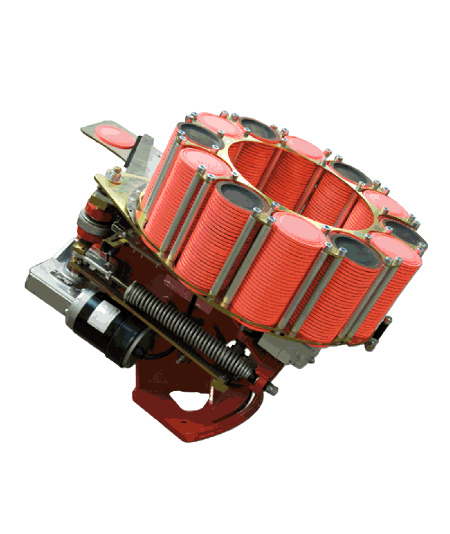 Featuring a new chassis, a new carousel that holds up to 550 or 700 standard clays, an improved finger positioning system and a tilted base which allows you to a set-up a lot of various flight paths. This makes it ideal for towers or installation in those hard-to-access areas on a course. The tilting base provides a multitude of possible trajectories thanks to a set-up of different angles (Horizontally: 35 degrees left and right; Vertically: 65 degrees back). Going even further than other traps, this machine also has the possibility to throw downward 25 degrees (Tilted support that is needed for this option is sold separately). Using simple tools you can change all settings (firing angles, spring tension and magazine assembly) with great ease. These machines are also available in reverse versions. Delivered with a 150' push button release cable. Laporte guarantees quality and guarantees all of the 185 PC 550/700 PRO 12C machines with a 3-year warranty. Derived from the sporting machine, the PC BATTUE 12C has already been a great success in numerous competitions. The PC BATTUE 12C lets you launch battue targets right side up and upside down. It is simple to use, robust and reliable. It has a capacity of four hundred battue clays and comes in both a standard and reverse version. Laporte guarantees quality since 1927 and guarantees the PC Battue with a 3-year warranty. The PC 12C MIDI PRO 90 has been designed to throw exclusively 90mm MIDI clays. Featuring a new chassis, a new carousel that holds up to 550 standard clays, an improved finger positioning system and a tilted base which allows you to a set-up a variety of flight paths. This makes it ideal for towers or installation in those hard-to-access areas on a course. The tilting base provides a multitude of possible trajectories thanks to a set-up of different angles (Horizontally: 35 degrees left and right; Vertically: 65 degrees back). Going even further than other traps, this machine also has the possibility to throw downward to 25 degrees (Tilted support that you need to do this is sold separately). Using simple tools you can change all settings (firing angles, spring setting and magazine assembly) with great ease. These machines are also available in a reverse version. An indispensable tool on a sporting ground, the Midi 90mm PRO combines reliability, robustness and simplicity to throw further distances. Delivered with a 150' push button release cable. Laporte guarantees quality since 1927 and guarantees the 185 PC Midi 90mm PRO with a 3-year warranty. The PC 70MM PRO 12C has been designed to throw exclusively 70mm “MIDI” clays. An indispensable tool on a sporting ground, the 70mm PRO 12C combines reliability, robustness and simplicity to throw further distances. Delivered with a 150' push button release cable. Laporte guarantees quality since 1927 and guarantees the 185 PC 70mm PRO 12C with a 3-year warranty. 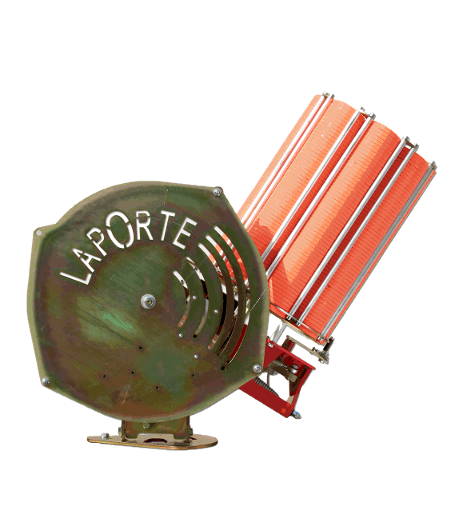 The last in the new LAPORTE® PRO range, this machine throws the Mini 60mm clays. 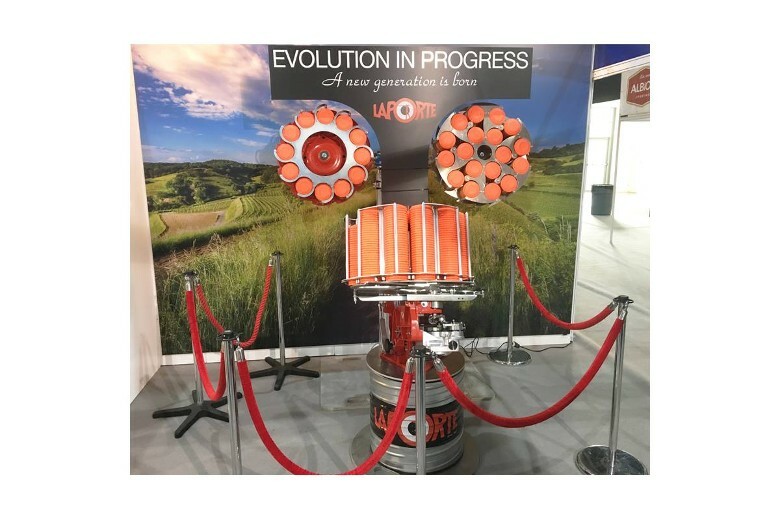 It brings together the latest technological innovations made to the LAPORTE® PRO range such as a new throwing plate for a better positioning of the clay, a powerful dual knife clay separation system for the clays, anti-shock drop plate, and a new body for improved stability. An indispensable robustness and simplicity. Delivered with 50 yards of professional cable. LAPORTE®, quality guaranteed since 1927, guarantees the 185 PC Midi 60mm PRO for 3 years. The machine that gives you the choice. The Rabbit Looper 8C is fully automatic and intended for sporting grounds. Born out of the Laporte know-how and competence, it proposes two innovative trajectory options: Rabbit (horizontal) or chandelle (different angles) of approximately 45o. 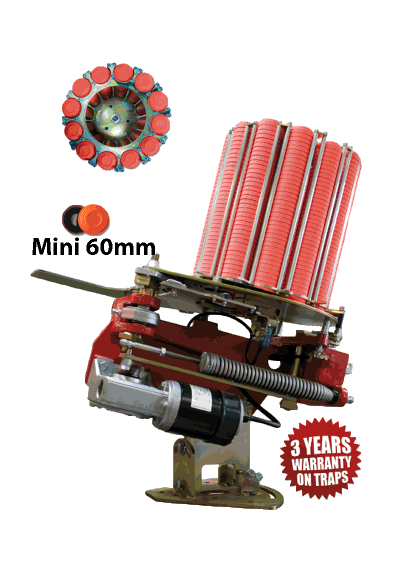 The Rabbit Looper 8C has a significant clay capacity of 400 rabbit targets, the new LAPORTE® adjustable base and a variable speed from 20 to 70 mph (depending on the spring option). It combines performance and security (thanks to the LAPORTE® safety guard) and simplicity. Delivered with 50 yards of professional cable. LAPORTE®, quality guaranteed since 1927, guarantees the Rabbit Looper for 3 years. From Teal to Chandelle in less than 30 seconds! The Teal Looper 8C is fully automatic and intended for sporting grounds. The latest born out of the LAPORTE® know-how and competence, it proposes two innovative trajectory options: vertical 90o (a perfect trajectory of up to 40 yards) or chandelle (different angles) of approximately 45o. The Teal Looper 8C has a clay capacity of 400 standard targets, a variable speed from 20 to 70 mph (depending on the spring option) and the new LAPORTE® adjustable base. It combines performance and security (thanks to the LAPORTE® safety guard) and simplicity. Delivered with 50 yards of professional cable. 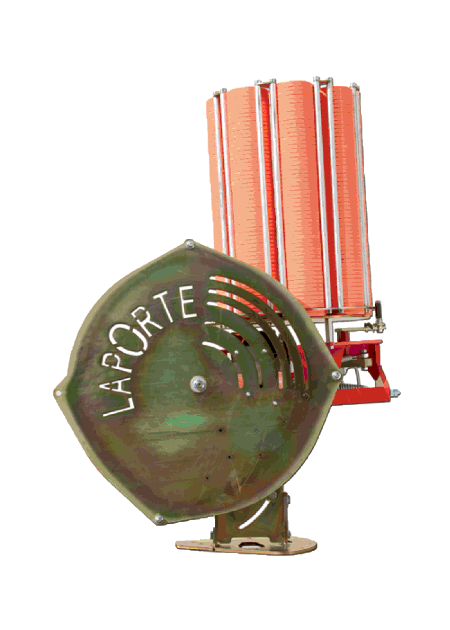 LAPORTE®, quality guaranteed since 1927, guarantees the Teal Looper for 3 years.